Clear skies. Fresh air. The blue planet. Sometimes we take living in harmony with nature for granted and we think, “Why me?” But after Karen had a bout with cancer at the age of 43 and Kathy started having some neurological issues, we truly began to think “something is terribly wrong”. Our philosophy is that we should all do what we can to protect the environment. Not only for the sake of preserving the earth for our children, but for the sake of our health today where we live and breathe! Green living starts with natural, non-toxic, biodegradable, concentrated cleaners that contain no phosphates or any other harmful “-ates”, with recyclable components. Let’s get every nook and cranny spick-and-span. Let’s make sure we do it right. We want you to be able to clean your bathroom without having to leave the house!!! Our products are safe, especially around your little ones; powerful against even the most stubborn dirt; green for the planet; and smart on your wallet. Add our superior, pro-grade quality microfiber tools and you will have perfected the art of housekeeping. The Art of Housekeeping is truly a wonderful experience in cleaning. 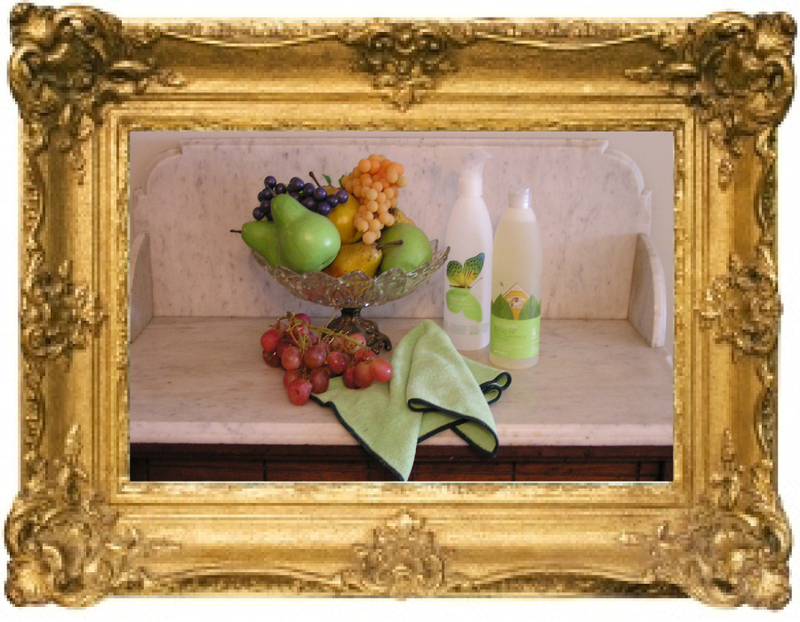 We share with you how to make cleaning your home an art and a science. Our products meet a high standard of safety and performance. Where you live and breathe is the first place to keep free of toxins that can compromise your health – toxins that can damage your respiratory and nervous system, as well increase your risk of cancer. Living in harmony with nature in your home or office is one of the most important and easiest ways to improve your health. Join us in living green! You will love the change! We’re going to make you smile! Our green cleaning supplies and tools are the best on the market today – otherwise, why would we recommend them? They will help you clean faster, easier and better. They will make you smile! The microfiber tools at The Art of Housekeeping.com are usually sold only to companies that clean professionally; but YOU need them, because if cleaning is necessary, we feel we should have the tools to do it right! 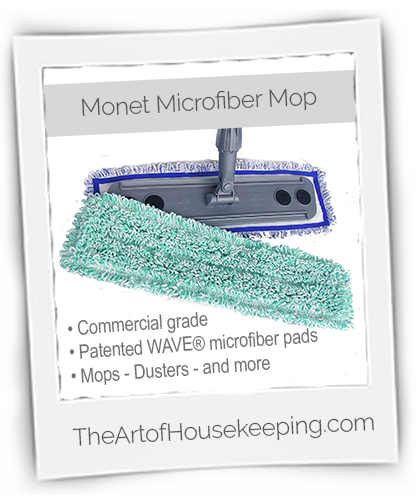 Your floors will make a good impression with our Monet Microfiber Mop. Take your cleaning to new heights with our Michelangelo Mini Mop. 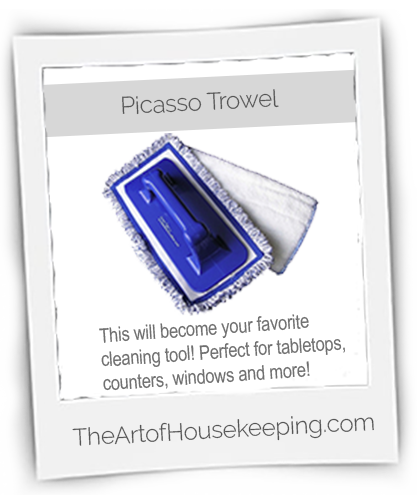 You can crazy clean with our Picasso Trowel. The DaVinci Dusters and Rembrandt Dust Mop are the best! 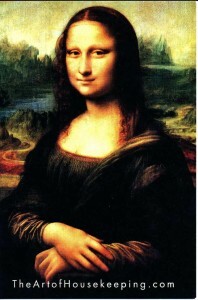 Everything is masterfully engineered and beautifully designed to create a masterpiece. We are also proud to offer all-natural-fiber sponges and scrubbers from TWIST. To go directly to the ever-popular BASIC H2 Organic Super Cleaning Concentrate and other GET CLEAN products, click here. BASIC H2 can be mixed for 1001 uses including windows, mirrors, floor, counters and degreaser. You won’t need a lot of different products with BASIC H2 around and ready to do so many jobs – and do them all remarkably well! Enjoy our videos and The ART OF HOUSEKEEPING. This is what you’ve been wanting and waiting for! One favorite product is Shaklee Basic H2®. It is a concentrated, biodegradable cleaner that you can use to clean everything from your barbecue grill to your windows! It’s been around for over 50 years and has been a mainstay in our cleaning closet. One day we were talking about sad it is that we were using such a great cleaning solution with a dirty old cotton mop or the sponge mops that we hang on to until they are so nasty we throw them away. And the Swiffer® products were expensive and filling the landfills with all those disposable wipes. It didn’t make sense. We saw how hospitals and institutional cleaning was taking place. They were using microfiber pads that were washable. Hmmmm. Clinical studies showed that a microfiber pad with an environmentally-safe cleaning solution has as good effective rate as a cotton mop with strong disinfectants. Wow! We are on to something. Then we saw that the microfiber cleaning products being offered to homes were cheap, not as effective and not ergonomic. We became distributors for one of the top microfiber producers in America. We bring commercial-grade microfiber cleaning supplies into your home at a great price. You will not find these products in stores! !